Leading topsoil, gravel, bark and rock salt supplier - Dandy's Garden Centre - have today announced savings of up to 75% across their best selling landscape and garden supplies range! Topsoil is now available from just £1.99 per bag delivered! Dandy's Garden Centre and Landscape Supplies have today slashed prices in their January sale even further. 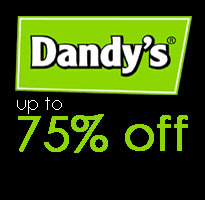 Online shoppers can now grab Dandy's best selling topsoil, gravel, bark and rock salt ranges at up to 75% off the RRP! Dandy's already offer the lowest prices online for quality landscaping products such as soil, compost, bark and aggregates - these extra savings can now see savvy shoppers bagging a tonne of soil for just £55.96 and a bulk tonne bag of de-icing salt for as little as £71.96! Sales Manager, Simon Hughes commented; "You can now buy topsoil online from as little as £1.99 per bag delivered - that's the lowest we've ever sold at! I would urge anyone looking to make-over their garden this year to get the topsoil, gravel or bark they need now, while our prices are so low. We're also selling rock salt at crazily low prices - simply due to the fact of us having a little bit left over from our 24/7 packaging spree before Christmas; once it's gone, it's gone though, so as soon as the surplus stock has been cleared we'll be pulling the salt out of the sale; again, I'd urge anyone who is worried about a late winter or anyone smart enough to be planning for winter at the end of this year already to snap it up while it's still available at up to 75% off the RRP!" These massive savings co-incide with the award winning company's Facebook and Twitter compeition to win a £100 gift voucher for use online at DandysGardenCentre.co.uk. To enter just like Dandy's on Facebook or follow @DandysDirect on Twitter! The sale is expected to end on 31st January but may end sooner; General Manager Jonathan Bellamy reported; "We launched the sale at 9am this morning (23rd Jan) and we've already seen sales rocket with two or three wagon-loads leaving our Deeside depot before midday. We've had to pull our accounts team onto the 'phones to keep up with all of the sales calls we're receiving; we've always found that online shoppers in particular love a bargain and our sale is appealing to those who are planning ahead with the intention to grow their own this spring and summer." Dandy's is an award winning producer and supplier of quality topsoil and other gardening and landscaping products. As market leaders in their field, Dandy's have a strong online presence backed by highly experienced sales and trade teams. You can shop online at DandysGardenCentre.co.uk or call 0845 456 3089 to speak to a member of the sales team.